Get ready for a curly musical tale, trotting into the Arts Centre Melbourne direct from London's West End this coming January 2016. Based one of the classic fairytale favourites, The Three Little Pigs will be performed live on stage in a musical adaptation. The stage show sees a collaboration of a famous UK musical theatre duo; George Stiles (music) and Anthony Drewe (lyrics). The widely acclaimed musical team duo previously worked on smash stage hits Mary Poppins and HONK! 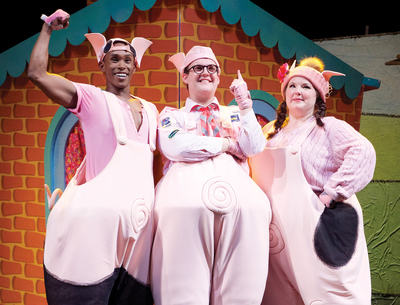 The Three Little Pigs, a' very curly musical tale' premiered at the Palace Theatre in the West End in August 2015. The colourful, funny show will appear at Arts Centre Melbourne’s Playhouse on Saturday 2 January and run until Sunday 17 January 2016. Expect a contemporary show featuring fun and colourful characters; three little pigs, their mother and the Big Bad Wolf. The famous story sees the piglets leave the comfort of their sty to start their new lives in the big wide world. The piglets are Bar, who loves to exercise, Bee, who is “green to the core”, and Q, the insatiable bookworm. Together, they learn to work together to defend their arch enemy, the Big Bad Wolf. The endearing curly tale will suit ages 3 years and above, with plenty of laughs that will tickle the whole family's sense of humour. 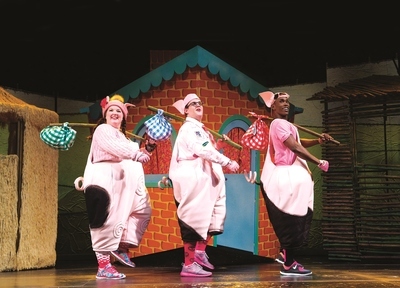 The Three Little Pigs production comes to Australia with Kenny Wax Family Entertainment. Kenny Wax Family Entertainment previously introduced the incredibly popular productions The Tiger Who Came to Tea and We’re Going on a Bear Hunt to Australia. The Three Little Pigs is set to follow a similar path, entertaining groups of Melbourne families and beyond this summer. Book: artscentremelbourne.com.au or phone 1300 182 183.